After Texas Hold’em, Omaha is the next most popular variant of poker in modern play. Omaha was once known as Omaha Hold’em, and shares a lot of similarities with Texas Hold’em, including the use of five board cards and four betting rounds. However, Omaha uses four hole cards instead of two, giving more opportunity for strategic play. While Texas Hold’em is often played no-limit, Omaha is usually played at pot limit (often referred to as PLO—pot limit Omaha). The object of Omaha is to form the best five-card poker hand from a combination of two of the four cards in your hand and three of the five shared cards (called board cards), or to bet in such a way as to convince your opponents that you have the best hand. Omaha uses a standard 52-card deck. 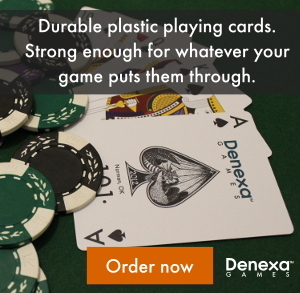 As always, we recommend using plastic playing cards, specifically Denexa 100% Plastic Playing Cards. All players either ante or post blinds, although Omaha is typically played with blinds. Shuffle and deal four cards to each player. These cards are called the player’s hole cards. Players inspect their initial hand, and then the first betting round, known as the pre-flop betting round, occurs. The first player to act is the player to the left of the dealer, unless blinds have been posted, in which case the player to the left of the big blind (referred to as being under the gun) has first action. The betting follows the usual pattern of betting in poker. If, at any time, all players but one fold, the pot is awarded to the last remaining player, and the hand ends. 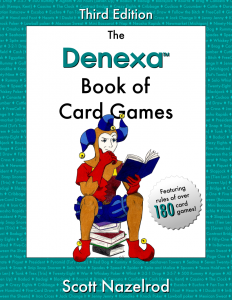 No further cards are dealt to “see what would have happened”, and the winning player is not required to reveal their hand. After the betting round has concluded, the dealer discards one burn card face down and deals three cards face up to the center of the table. (See “Dealing the flop, turn, and river” for more information on how this is performed). These three cards, called the flop, are the first three of the five board cards, and can form part of every player’s hand. After the flop, another betting round occurs, with first action going to the player to the left of the dealer (the player who posted the small blind). When the flop’s betting round is resolved, the dealer burns one card and deals another card face up, called the turn. As before, another betting round is conducted, after which another card is burned and the fifth and final board card, the river, is dealt. One final betting round is conducted, and then each player reveals their hand. The player who has the best five-card poker hand, using five of the seven cards available to them (three of the five board cards and two of their four hole cards), wins the pot. It must be emphasized that a player must use exactly three board cards and two hole cards. A player may not use all four hole cards, nor can they use one hole card and four board cards, nor can they “play the board” (use all five of the board cards as their hand).